This blog has moved to www.didyoucheckfirst.wordpress.com. Hope to see you there. Here's a byproduct of the so called Right-To-Work laws I never knew: besides being a masterful bit of marketing in terms of its labeling, these laws have helped to move jobs from Northern states to Southern states and eventually to cheaper overseas markets. In fact, the more I learn about them, the more I come to understand that they are anything but a vehicle to ensure anyone's "rights" or that there's work created by them for anyone. At least not work normally associated with what we fancifully recall as a middle class lifestyle. As the New York Times op-ed piece entitled, "Workers' Paradise Lost" points out, union and non-union workers both benefit when unions are more powerful and influential. Corporations once literally had to compete for labor by offering good wages and benefits. Here's another new fact I learned from the Times op-ed. The Taft-Hartley Act was pushed through in 1947 by "pro-business Republicans and Southern Democrats" in the immediate wake of the UAW's rise to prominence. This Act was how states in the South and out West were able to pass right-to-work laws and attract businesses away from their neighbors in northern markets with cheaper labor. I didn't know how it had gotten started and that it went back that far. And what happened next and when corporations felt that the labor wasn't cheap enough in the South and West? What has been happening since the early 80s and as unions have continued to lose their influence over elected officials, corporations, and thanks to years of vilifying by corporations and the GOP, even the influence unions and their members had with their neighbors? Where did business look for even cheaper labor? It wasn't on these shores. 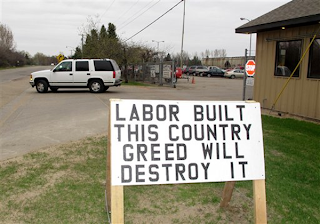 Labor is and was increasingly powerless to fight the flight of manufacturing overseas. It's sad when you consider that they couldn't even get their neighbors to stand with them to defend those jobs, and that those neighbors all too often are still jealous of what they perceive to be the largess of being a union worker. All of us owe a debt of gratitude to organized labor for basically forcing corporations to share the wealth. That's not a dirty or even Socialist expression. Labor is what brings into being and delivers to market the creativity and genius of the entrepreneur. One cannot exist without the other. It must be understood, however, that only one side has the "accounts receivables" and, hence, control over how revenues are distributed. CEOs didn't always make hundreds and even thousands of times what they pay their workers, and corporate profits overall in America are at historic highs. We also owe a debt to unions for things we take for granted today. Things like child labor laws, workplace safety, the 8-hour workday, the 5-day week, and so much more. When examined purely from the economic and business perspective, these changes would probably never have come into being without workers literally dying as part of the labor movement to win them. These are all things worth thinking about the next time we're tempted to side with trickle down theorists and defenders of capital - as if they needed us to stick up for them. Actually and come to think of it, maybe they do. So long as they - and let's be candid, "they" are big money, corporations, and most assuredly the Republican party - are successful at duping so many of the middle class into believing the "us versus them" of non-union versus union, we're likely to see the scales continue to tip away from the middle class and even more toward the wealthy. It's like something I saw recently on Facebook that said (and I'm paraphrasing), "Don't be jealous of my union benefits. Demand your own." I agree with that sentiment. The scales of labor-management are out of balance. I think it's important to understand whose thumbs are on it and how the scales continue to tip toward the 1-percenters and big business. If we don't bring the scales back to the middle then my advice is that we might want to start thinking up names for this new Gilded Age. The labels that can probably best be used to describe me would be atheist, environmentalist, social progressive, and political liberal.